The Sound of Music: Embracing The Open Space Around You. Picture yourself doing the star solo spot of a show stopping 11 o’clock number in a Broadway show. Now picture yourself singing in front of a table full of people at the final callback for a major production. Now picture yourself in your voice lesson. In each of those scenarios, think about the amount of open space you have around you and what might feel like to fill that space with your energy and with your voice. Hopefully as you imagine the sensation, it feels relaxed, released, energetic and free. Many times when I am working with a student, I find that a large part of what is keeping them from reaching an honest, free sound is the fact that they are not willing or able to release their sound or energy into an open space. Without really realizing it they are shutting themselves down and refusing to free their instrument. When I discover this happening , I like to introduce them to the “Sound of Music”. 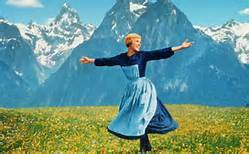 In this exercise I have the student imagine they are Julie Andrews in The Sound of Music ( in the beginning of the movie) . She’s on top of the Swiss Alps with nothing but open space around her, her arms are stretched out and she is spinning like there’s no tomorrow. Usually , I have a student imagine they are holding giant hands full of autumns leaves or glitter dust (whatever sparks their creativity) at the center of their core in their hands. I then have them take as breath and open their arms and release an extended sound on any pitch that feels comfortable while envisioning releasing that object into the open space ( Swiss Alps) around them. The result is generally instant , effortless and very effective. From there, we will go further and explore what it feels like to explore a truly released sound in an open space in an effortless way throughout their range. I’ve also noticed over the years, that generally, the first time someone comes in for a lesson, their instinct will tell them to stand right next to the piano when they start to sing. It’s as if we somehow think the piano has a magic ability to help us to sing better by staying close to it. (* Note: While pianos are wonderful instruments , they currently have no proven magical powers.) Realistically there are very few performance or audition instances where we find ourselves actually standing that close to the piano. I encourage my students to take the space available in my studio and own it in a truly energetic way. It’s what we do when we perform and we need to practice that in our lessons as well. If we can own the space we are in and allow our voice to fill that space in a free and comfortable way, we will inevitably be at an advantage. I spent several days recently teaching a vocal technique and vocal performance workshop to a lovely group of students from Shore Crest Prep in Florida. During our work together , many of the students made big vocal strides simply by embracing this idea, it was just fantastic to see their voices open up and really shine as they released their sound and let it fill the space around them. We also use this idea consistently in The Broadway Warm-Up. Several times in the warm-up you will find yourself opening up your arms or expanding your space for a port de bras. Explore what it feels like to really embrace the space around you in these moments. Imagine the room you are warming up in is limitless so that your energy and sound can extend well beyond the borders of that space with out any efforting. I truly believe that one of the things that is so inspiring about the human voice is the fact that we are literally transmitting a part of ourselves through the vibrations we create when we sing. It’s incredibly vulnerable to release that voice into the world and let it be heard, but when you do, the reward for everyone involved can be immeasurable!